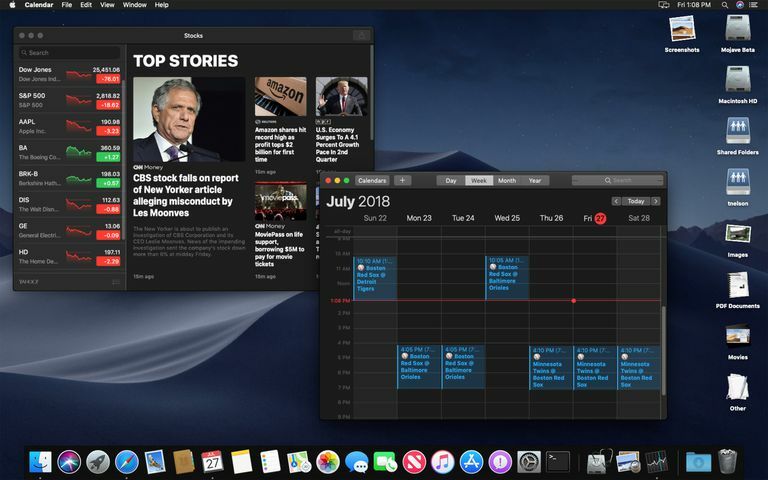 macOS Mojave with Dark Mode and Dark desktop. MacOS Mojave's Dark Mode is a system-level setting, but each third-party app needs to be updated to take full advantage of Dark Mode (and to look good). Your Mac will need to be running macOS Mojave or later. If you haven’t updated to a recent version of the Mac operating system, you can find instructions in the guide How Do I Install Mac OS Updates From the Mac App Store? Launch System Preferences by clicking the System Preference icon in the Dock or selecting System Preferences from the Apple menu. In the System Preferences window, select the General preference pane. Next to the Appearance option select the Dark option. The Dark Mode appearance will be applied to menus, buttons, and windows. Almost all of the Apple-supplied apps, such as Photos, Mail, Maps, and Calendar all have support for Dark Mode. But if you were hoping for complete darkness to settle onto your Mac, there are a few more steps you will need to take. The most glaring area that needs to be toned down is the Mac's desktop. You can just choose your own custom image for the desktop using the guide Personalize the Mac's Desktop Wallpaper With Your Own Pictures, but a better approach may be to make use of the Dynamic desktop images includes with macOS Mojave and later. Dynamic Desktop Images can change appearance, tracking the time of day and producing darker wallpaper at night, and brighter desktops during the day. But the Dynamic Desktop images include with your Mac can also be set to display a light or dark image continuously. If you choose the dark desktop image you can further enhance the Dark Mode interface. Launch System Preference and select Desktop & Screen Saver preference pane. Make sure Apple, Desktop Pictures folder is selected in the sidebar. Pick a Dynamic Desktop image from the collection. Next to the preview thumbnail is a drop-down menu. Use the menu to select Dark (Still). The desktop will change to show the dark version of the selected image. Dark Mode is not the only feature built-in to the Mac OS that can help relieve eyestrain. Night Shift can adjust your displays brightness and white point balance depending on the time of day to reduce fatigue.